I thought it might be useful to bring together ten of the most popular videos from Google’s Webmasters YouTube channel. I’ve taken the liberty of filtering out the marketing videos and have just focused on the freely given SEO advice. Most of these feature Matt Cutts answering user-submitted questions or Maile Ohye giving general advice. These are pretty jargon-free and are clearly intended for webmasters without much working knowledge of SEO. I don’t think the Circles feature of Google+ deserves the praise it’s getting. The circles themselves are gimmicky and lack utility. It’s good that Google is making privacy a selling point of G+, but I think that’s where the praise for circles should end. Google have become the giant they are by giving people what they want. They’re now so good at this they can actually predict what people are most likely to want. This has given them a lead in areas you wouldn’t imagine, like spelling correction or translation. I wonder if this approach will have negative consequences down the road though. Google isn’t suggesting the best results, it’s suggesting the most popular. I don’t think we really need this kind of help. I’ve been having a bit more fun with the Google Ngram Viewer (previously). A reminder that these graphs show how much these phrases have appeared in published works over time. They are case-sensitive and I’ve used the English corpus. Throughout my investigation I had nagging doubts that we were seeing serious cracks in the algorithmic search foundations of the house that Google built. But I was afraid to write an article about it for fear I’d be claimed an incompetent kook. I wasn’t comfortable sharing that opinion widely, because we might be doing something obviously wrong. Which we tend to do frequently and often. Gravity can’t be wrong. We’re just clumsy … right? Google, Google, Why Hast Thou Forsaken the Manolo? Yesterday I was searching for CSS rounded corner techniques, and the majority of top Google results were utter trash. This is definitely a trend. 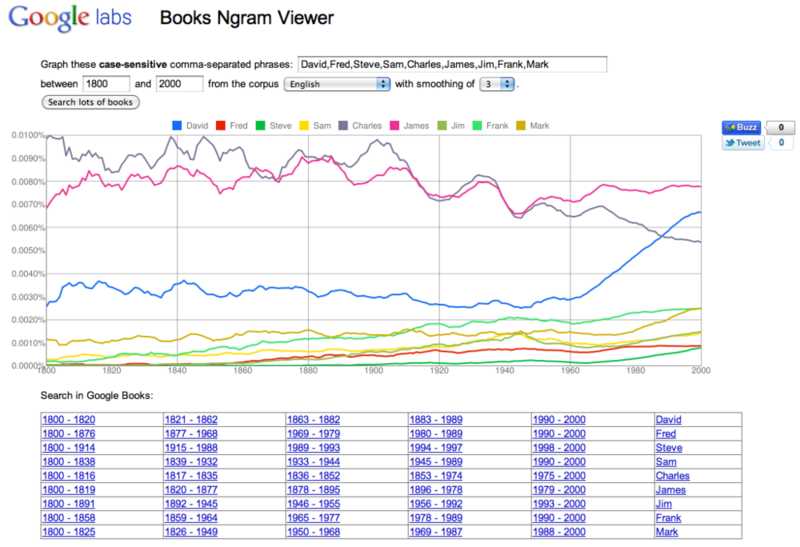 A few days ago Google launched the Google Books Ngram Viewer, a labs project that lets you compare the frequency of word use in published works, and compare these terms over time. For example, the following is a variety of common first names appearing in the English database over the last two hundred years. You can see that around 1960, the name David suddenly started to gain in popularity. You can narrow the English corpus to American English, British English and English fiction, and also search works in other languages. No big surprises that the Sun, Mirror and News of the World sit together at the bottom of the list, or that they’re joined there by the commuter freebie Metro; nor that the FT contains almost no “basic” language pages and the most “advanced”. But the middle of the table is more interesting, with the Guardian scoring much the same reading age as the Daily Mail, and the Independent sitting at the top of the qualities isn’t necessarily what I’d have guessed.